I should have told you first thing on Monday that the spinning mojo is back but here it is Wednesday and I’m just letting you know. Sorry. I got caught up in Oscar fever, what can I say? Anyway, both Rosie and Lucy were back in business by Thursday night. Dale took Lucy to the hardware store and they fixed her up with a 16¢ washer that did the trick. Big spender that he is, Dale bought a spare in case this happens again. Meanwhile, I procured some cotton rope at a different hardware store and Dale helped me install Rosie’s new drive band. With both wheels fully functional again I was able to finish some yarn. 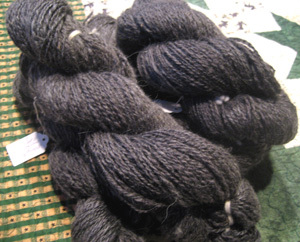 This incredibly soft merino/alpaca/silk blend is something that I bought from Indigo Moon at SPA 2006. I’ve got about 975 yards and I’d like to make a shawl from this. I’m currently debating Seraphim or Icarus, I just can’t decide. I’d love to hear from those of you who have knit either of these shawls. I also finished the Spunky Eclectic superwash. I’ve got 350 yards there and it’s probably sport weight. Any suggestions for what to knit with this? Because, you know, making yarn is nice but knitting with it is even nicer. Right, Margene? And speaking of Margene, tomorrow is March 1st and, while I’ve done plenty of spinning, it’s time to get the knitting done for Twisted Knitters. It’s a tough job. Sigh. But someone’s got to do it. They are both gorgeous! Two-ply? How about Lisa Lloyd’s Zig Zag Lace for the Spunky yarn — you have enough yardage. Or socks. I think Seraphim on the shawl — that color is SO pretty. The yarn you spun is beautiful! I’m sure whatever you decide to knit will be lovely. If you’re going to do Lisa Lloyd’s zig-zag lace hurry and get the pattern- it will be unavailable soon as she comes out with her new book in 2008. Lovely handspun dude. I think the merino blend would make a lovely Seraphim shawl. I’m currently knitting that pattern in handspun, so maybe I’m biased. It’s a pattern that lends itself perfectly to the use of handspun yarn. Yay for Dale getting the job done. The top yarn looks so nice, great color. Both yarns are beautiful! I especially love the colors of the spunky yarn. Maybe some sport weight socks. Some people don’t like the heavier weight socks, but I love them and I think those colors would make a nice looking pair of socks. Beautiful spinning! That Spunky Electric plied up nicely! Someone posted a picture of the new shawl in Wild Fibers the week…..even though it’s not one of your shawl choices….it’s worth taking a peak at. Very pretty! I haven’t knit either of those shawls but I would vote for Icarus. I have heard all of that stockinette can get a little tedious but the end product sure is lovely. I just finished Icarus and really enjoyed it. I actually did not find the stockinette sections tedious — at least you can knit your lace while watching TV or something during that part. The hardest part is those loooooong rows at the end, but the final product is so lovely. I chose it because I wanted a shawl that did not have all-over patterning, but just some laciness at the border. I love it. I meant to ask you abou the wheels yesterday. How wonderful they are both functioning again and you are able to produce such lovely yarn. Truthfully I have only spun little bits without much yardage. From now on I’ll buy MORE fiber to make sure I have enough. Go with Seraphim! It will be so beautiful in that color and would be wonderful to wear to your reinactments, too. My dream is to some day knit a shawl with the yarn I spin. So far my spinning isn’t up to it, so I’ll have to live vicariously through you. I haven’t knit either Seraphim or Icarus, so I can’t give any advise. I will say they are both gorgeous and are pretty high on my list. My vote is for Icarus!! Beautiful yarn…Spunky Eclectic is SO pretty! Both yarns are lovely. I co for Icarus and well, we didn’t have a meeting of the minds. I hated all the purling on the back side. On the other hand Cheryl’s Seraphim is very inspiring so with hers fresh in my mind, I’d vote Seraphim! Be still my heart. Your handspun is absolutely gorgeous. Puurrrrrr. I’ve knit a Seraphim (You may have noticed it?? Ha!) and I’m halfway thorough an Icarus. I think they’d both be good with the merino/alpaca/silk, but I’m leaning towards seraphim. Although I think that Wild Fibers Buffalo pattern would be excellent for it too. Beautiful spinning! I think that merino alpaca will make a lovely shawl, no matter the pattern. Do you have enough for some socks with Amy’s stuff. I’m a sucker for handspun socks though. Glad you’ve got both of those wheels back in action. Some funky mittens would be fun in the Spunky Eclectic yarn. Glad you’re back in action with the wheels, that’s great! I say go for Seraphim! I like both patterns, but Seraphim was my first lace pattern and I just adored it, in fact, still do. I’m contemplating making another one for my mom in Plain & Fancy Sheep & Wool yarn purchased at Estes last year. Hooray for cheap repairs. I’m finishing my own Seraphim and I love it so that’s where my vote goes. Thanks for the reminder that I needto complete the knit part of Dye Spin Knit. I’ve knit Icarus and it was really fun to knit. I’d say it would be a good candidate for the Indigo Moon because that shawl is really all about the yarn, and you won’t lose either the lovliness of the yarn or the pattern with what you’ve got there! And as for the superwash – do we have to say it? Socks, dude! Socks! Beautiful yarn! There really is nothing better than knitting with your own handspun yarn. I’ve not knit Seraphim, but it’s on my list. Icarus is currently in my basket but I’m not loving the color I chose, so I’m probably going to frog it and start over with something else. I think either would be brilliant. As for the 350 yds of sport weight superwash, clearly socks! But I’m a sock-a-holic, so there you go. Lovely yarns! Glad your mojo is back. I vote for Icarus as well. I love that shawl. Now if I could just get myself to finish mine! And I think the Spunky yarn would make a pair of awesome socks too. 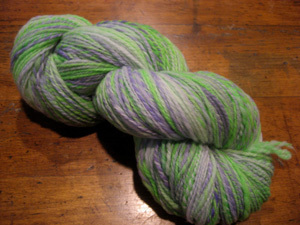 Sportweight superwash, in those colors, would be awesome for a baby sweater. Some sort of lacey scarf would be fab in that Spunky Electric. Your spinning looks awesome – yay for Dale getting you back in business. Your handspun always looks so fantastic. I love my Seraphim and kind of dropped the ball on my Icarus, but I think either would be lovely. Perhaps you just need to ask yourself if all the stockinette with no breaks would be tough for you to get through and if the eyelet pair stripes in Icarus would be easier? I’m knitting Icarus right now, and I think it looks great in darker colors………Seraphim looks very similar but has little yarn overs throughout the stockinette. I just didn’t think that I wanted to pay that close of attention……..But, then, of course, you’re an expert lace knitter…….:)! I love your choice of colors. Would you have enough for a bag? It would go with so many things. I wasn’t overjoyed at how my Seraphim knit up. I am a bit envious of your yarn making ability. I see people spin and I just can’t find that mojo. It is elusive to me. I’ll just stick with the knitting but I will always look at you spinners with awe. Oh, you NEED to knit some socks with that Spunky Electric! Lime and Violet, anyone? Love the Spunky colorway. Isn’t she great? 350 yds might make a nice lace shallow triangle scarf…. I vote for the Seraphim myself. You aren’t kidding about the mojo being back! Well, that may SEEM extravagant of Dale, but when you’re talking about back-up parts for repair, well, that’s just being PRACTICAL…. Beautiful Beautiful! Congrats on getting the mojo back. Glad your spinning mojo is cookin’ again! Beautiful handspun! Glad your mojo is back. Your spinning looks wonderful! Good luck with picking out patterns. I’m not much help with that because the only thing I can think of for the spunky stuff is jaywalkers. That merino/alpaca/silk blend looks gorgeous! It’ll make a lovely shawl. Just want to add to the congratulations on the return of your spinning wheels. Bring on the spinning mojo! Looks great! I would vote seraphim as well. Something about the pattern just looks good to me.